What George Bush Sr. disparagingly called ‘the vision thing’ should not be lightly dismissed. A clear vision is important for at least two fundamental reasons, and never more so than at the outset of your career. First, because a vision stems from and embodies our values, as Clem Bezold so nicely puts it, and health promotion is – or should be – a strongly value-laden undertaking. Second, because a vision is aspirational. My favourite definition of a goal was one developed by the US Public Health Service in about 1979: “A goal is a timeless statement of aspiration”. So too is a vision, which in many ways is simply a more fleshed-out version of a goal, at least a goal defined this way. For me, then, a vision is something that embodies my core personal and professional values and is something I am constantly striving for, usually with like-minded colleagues and friends, but perhaps never reaching. As a futurist myself, I am very comfortable with the notion that some of the things I aspire to and am working towards may not be achieved in my lifetime; I am content to make progress, or sometimes simply not to be driven back, or not as far back as I might have been. Let me ilustrate the importance of vision and values with my own experience. Thirty-five years ago, I used the final major paper of my Masters program to explore what were the foundational principles of public health. I came up with two: ecological sanity and social justice (Hancock, 1981); today we would say sustainability and equity. (In retrospect I also missed at least two; peace/non-violence and community empowerment.) Those principles – values, really – have guided my entire professional career; in one way or another, I seem to incporporate them in everything I do. But I can also see, looking back, that they have older and deeper roots for me. As a youth I was what in England then was called a naturalist, and had thought I might like to become a nature documentary film-maker. So an interest in what became better known as ecology was an early influence in my life. Then, at the age of 18, I went to Sarawak (a Malaysian state in the northern part of Borneo) as a volunteer teacher, where among other things I became aware of the importance of community and the relative unimportance of medicine in making a relatively impoverished, but relatively well-functioning community healthy. Later, while still in medical school, and because of my earlier experiences, I became interested and then involved in the early days of ecological politics, as an area organiser for the new ecological political party then being established, in response to the call in Blueprint for Survival (The Ecologist, 1972) for such parties to be set up. Then as a family phyician first in rural New Brunswick (a province in Atlantic Canada adjacent to Maine) and then in a community health centre in Toronto, I was brought face-to face with poverty and its health consequences, and again realised that medicine had it limitations in the face of poverty, and that the solution lay in political, economic, social and environmental change. So by the early 1980s, as I turned from family medicine to public health, I was already quite steeped in ecological political thought, social justice issues, community engagement and a commitment to a public health approach. But what made such a difference, for me, was the succinct summary of all of that into what I saw as the two fundamental principles of public health: ecological sanity and social justice, and indeed the integration of those principles with each other as a means of achieving better population health. 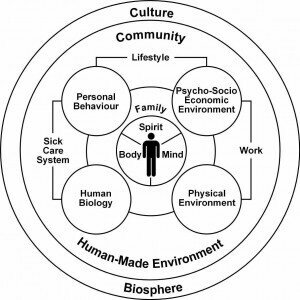 One can see that clearly in the Mandala of Health, a model of population health that I developed with my dear friend and colleague Fran Perkins in Toronto in the early 1980s as we helped create a new form of municipal public health (Hancock and Perkins, 1985; Hancock, 1985). 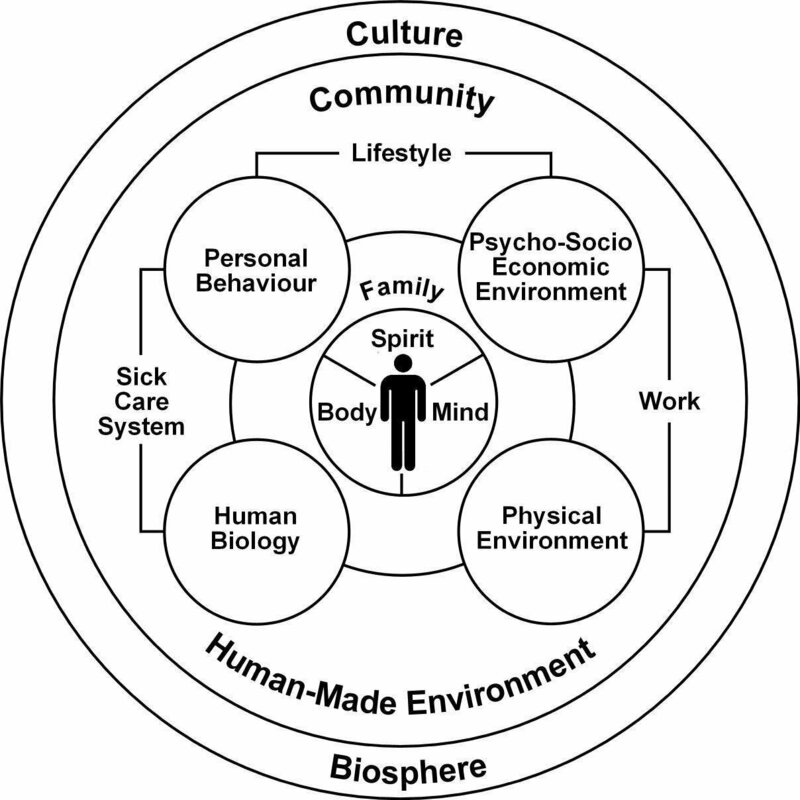 We described the Mandala as a model of the human ecosystem, and it quite explicitly integrated both the natural and social sciences at all levels from the person to the planet. 30 years later, I still find it a useful model. All these ideas came together in the practice of ecological politics; as Rudolf Virchow so powerfully stated in 1848, ‘medicine is a social science, and politics is but medicine writ large’. I cannot easily conceive of health promotion as being a-political, because health promotion is so strongly value-laden and, after all, politics is all about values. So I helped to found and was the first leader of the Green Party of Canada, and of course ecological sustainability, social justice, peace and community empowerment are fundamental principles within Green politics. In time, I moved on from the practice of ‘big-P politics’ and helped to create what is now a world-wide movement of healthy cities and communities. But the same principles still apply, and still drive my work in this area. In seeking to become more healthy, cities and communities around the world have to struggle with and try to address issues of social justice, peace and safety, ecological sustainability, community engagement, citizen participation and what has come to be known as ‘healthy urban governance’. What drives me forward and sustains me, and what I think does so for them, is a vision of what a healthy, sustainable, safe, just and well –governed community would be like. So my crucial piece of advice to you at the outset of your career is to be clear about your values, frame them in some form of aspirational vision or goal, and then look at how you can work with others to make them, at least in part, a reality. So what do sailing lessons have to do with all this? Well, having a dream or a vision is all very well, but as the aphorism has it, a vision without a plan is just daydreaming, and a plan without a vision is just tinkering with things. But I have come to agree with the great planning theorist Charles Lindblom that comprehensive strategic planning is not going to work, in part because of what he called the ‘tragic discrepancy – big problem, small brain’, and in part because in periods of rapid change such as we are experiencing, most plans are already out of date by the time they are published. Circumstances change, and thus plans constantly have to be changed and adapted. What we need is not so much a master plan as a master process. At the same time, I do not believe in a pure version of Lindblom’s ‘muddling through’ strategy, or disjointed incrementalism, to give it its technical name. Instead, I am a great believer in the “vision directed muddling through” approach to planning and action. Whether we are trying to create change in a community, a work place or any other setting, we need to have a very clear – and shared – vision of where we want to be and what it would look like if we achieve what we hope to achieve. But the process of getting from here to there is never a simple one, never amenable to simplistic and fixed plans, so while we know where we want to be, we don’t really know how to get there. So we need a process of muddling through, taking advantage of every opportunity that gets us a step closer to our goal. As a student of sailing, I have found it useful to think of this process as analogous to sailing against the wind and through the reefs from one harbour to the next. Unlike the captains of power boats, who can just open up the throttle and go in a straight line from one harbour to the next (and who can end up in deep trouble if there is a mechanical failure or if they run out of fuel), change agents, like sailors, have to take sensible precautions and follow simple rules. For those of a nautical bent, such as myself, the following hints may be helpful. When sailing against the wind, it is necessary to tack back and forth: sometimes you can sail a long way and yet make little progress towards your goal. Sailors must be alert to shifts in the (political) winds: if the wind shifts (an election), you may have to change your course completely. Sometimes, the only way to get around a reef is to sail back the way you came for a while. If the wind gets too strong, you may have to run for a safe harbour and wait for the storm to die down – which is usually when they evaluate you! If the wind drops and you are becalmed, you just have to sit there and wait for the wind to pick up again. Be prepared for the journey to take a lot longer than you thought it would! The “crew” are involved in deciding what the destination will be; be prepared for the destination to change half way there! You need an experienced captain and crew, a team that works well together even in the roughest of storms. The Skipper has to be respectful of the crew, or he/she may risk a mutiny. If things get really nasty, the boat may start to sink. Make sure you have a life raft and some emergency rations! Finally, but perhaps most importantly, navigation hinges on two things: knowing exactly where you are and knowing where you want to be. This is equally true of the community development process. We need to know exactly where we are in terms of our community’s environmental, social, political, economic, health and cultural conditions and we need to know both the good news and the bad news. We also need at least a pretty good picture of where we want to be, even if we don’t have the precise coordinates and the destination may change. And remember, much of the point of sailing is to enjoy the trip, getting to your destination is an added bonus!